Taking Notes By Hand May Be Better Than Digitally, Researchers Say Researchers Pam Mueller and Daniel M. Oppenheimer found that students remember more via taking notes longhand rather than on a laptop. It has to do with what happens when you're forced to slow down. Laptops are common in lecture halls worldwide. 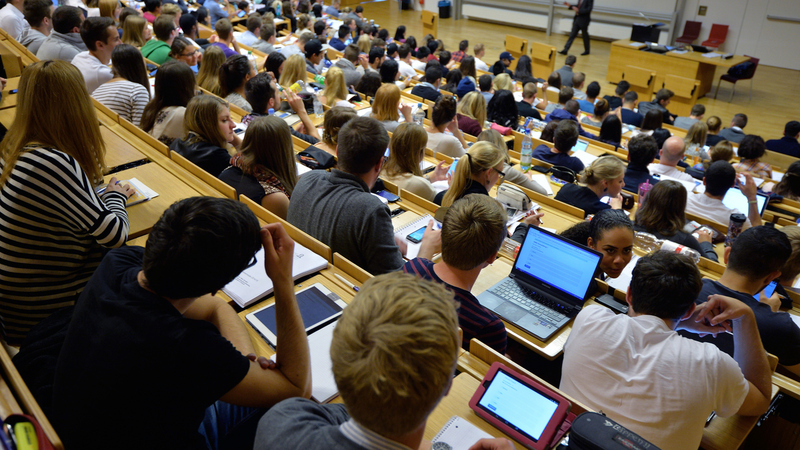 Students hear a lecture at the Johann Wolfang Goethe-University on Oct. 13, 2014, in Frankfurt am Main, Germany. As laptops become smaller and more ubiquitous, and with the advent of tablets, the idea of taking notes by hand just seems old-fashioned to many students today. Typing your notes is faster — which comes in handy when there's a lot of information to take down. But it turns out there are still advantages to doing things the old-fashioned way. For one thing, research shows that laptops and tablets have a tendency to be distracting — it's so easy to click over to Facebook in that dull lecture. And a study has shown that the fact that you have to be slower when you take notes by hand is what makes it more useful in the long run. In the study published in Psychological Science, Pam A. Mueller of Princeton University and Daniel M. Oppenheimer of the University of California, Los Angeles sought to test how note-taking by hand or by computer affects learning. "When people type their notes, they have this tendency to try to take verbatim notes and write down as much of the lecture as they can," Mueller tells NPR's Rachel Martin. "The students who were taking longhand notes in our studies were forced to be more selective — because you can't write as fast as you can type. And that extra processing of the material that they were doing benefited them." Mueller and Oppenheimer cited that note-taking can be categorized two ways: generative and nongenerative. Generative note-taking pertains to "summarizing, paraphrasing, concept mapping," while nongenerative note-taking involves copying something verbatim. And there are two hypotheses to why note-taking is beneficial in the first place. The first idea is called the encoding hypothesis, which says that when a person is taking notes, "the processing that occurs" will improve "learning and retention." The second, called the external-storage hypothesis, is that you learn by being able to look back at your notes, or even the notes of other people. Because people can type faster than they write, using a laptop will make people more likely to try to transcribe everything they're hearing. So on the one hand, Mueller and Oppenheimer were faced with the question of whether the benefits of being able to look at your more complete, transcribed notes on a laptop outweigh the drawbacks of not processing that information. On the other hand, when writing longhand, you process the information better but have less to look back at. For their first study, they took university students (the standard guinea pig of psychology) and showed them TED talks about various topics. Afterward, they found that the students who used laptops typed significantly more words than those who took notes by hand. When testing how well the students remembered information, the researchers found a key point of divergence in the type of question. For questions that asked students to simply remember facts, like dates, both groups did equally well. But for "conceptual-application" questions, such as, "How do Japan and Sweden differ in their approaches to equality within their societies?" the laptop users did "significantly worse." The same thing happened in the second study, even when they specifically told students using laptops to try to avoid writing things down verbatim. "Even when we told people they shouldn't be taking these verbatim notes, they were not able to overcome that instinct," Mueller says. The more words the students copied verbatim, the worse they performed on recall tests. And to test the external-storage hypothesis, for the third study they gave students the opportunity to review their notes in between the lecture and test. The thinking is, if students have time to study their notes from their laptops, the fact that they typed more extensive notes than their longhand-writing peers could possibly help them perform better. But the students taking notes by hand still performed better. "This is suggestive evidence that longhand notes may have superior external storage as well as superior encoding functions," Mueller and Oppenheimer write. Do studies like these mean wise college students will start migrating back to notebooks? "I think it is a hard sell to get people to go back to pen and paper," Mueller says. "But they are developing lots of technologies now like Livescribe and various stylus and tablet technologies that are getting better and better. And I think that will be sort of an easier sell to college students and people of that generation."